Horror fandom is a tricky thing. On some level, it’s a community separated by age groups, and the technology that was available to viewers from each group during their nascent years … their horror “coming of age,” as it were. A younger horror fan who came of age in the late 2000s might never have developed the nostalgia for things that older horror geeks take as a matter of course, such as the tactile delight of browsing a video store filled with dozens or hundreds of shocking VHS or DVD horror covers, arranged like a bloody buffet. They might likewise be completely unfamiliar with the concept of the classical “horror host,” those personalities who for decades reigned on local TV networks, introducing each week’s late-night horror feature to hungry audiences who had no other way to discover these gems of offbeat cinema. And so, a younger horror fan could probably be forgiven for not knowing the likes of Joe Bob Briggs. But to a certain segment of horror geeks, Briggs is nothing short of royalty—a guide and friend who introduced them to countless classic and not-so-classic genre films in the ’80s and ’90s, first with his landmark series Joe Bob’s Drive-In Theater on The Movie Channel, and then as the host of TNT’s MonsterVision block until 2000. Along the way, he pioneered a new style of colorful movie hosting, harnessing the character of a streetwise Texas redneck who reveled in a sincere love of “drive-in movies” and presented them with both critical acumen and everyman appreciation for cheap thrills—an unusual combination that has been difficult for others to imitate in the years that followed. But things change, and just as the rise of streaming services gutted traditional modes of video rental, they did the same to concepts such as the “horror host,” with the notable exceptions of those who moved online, to ever-nichier audiences. As for Briggs, he’s kept busy in the years since—primarily as a film writer under his birth name, John Irving Bloom—but there have always been fans awaiting a true return of Joe Bob’s Drive-In Theater. And now, thanks to the streaming service Shudder, they’ll get their wish … for at least 24 hours, that is. This Friday the 13th of July, 2018, Briggs returns to the (streaming) airwaves to host The Last Drive-In With Joe Bob Briggs, a 24-hour (or more) marathon of 13 (or more) films presented by horror streaming service Shudder. All of the old, classic segments will be back, from the host’s famous “Drive-in Totals” lists, to the pin-up “mail girl” segments, so we thought this would be the ideal time to gather some opinions from Briggs on both the legacy of his series and his outlook on the modern horror genre. As it turns out, it’s a reprisal of the art form that Briggs has been anticipating for quite a while. Vintage weirdness, in the form of Basket Case. At the same time, though, Briggs defies what a horror geek might expect in the sense that he doesn’t exactly hold the tenets of the past as sacrosanct. In fact, he instead chides filmmakers who lean too heavily on past eras of horror, such as the enduring nostalgia for the ’80s, when trying to make modern features. This isn’t to say that Briggs believes there to be no films of value in modern genre filmmaking—far from it. He cites Get Out as his favorite film of 2017, praising it as a “wonderfully conceived, executed and performed thriller,” although he says it probably shouldn’t be treated “like the Citizen Kane of our time.” He also says he was pleasantly surprised by Andres Muschietti’s It, particularly in the sense that the script stuck to the child’s perspective present in Stephen King’s novel. A creepy still from Tourist Trap. From there, our conversation turned to a bevy of horror topics, including the way that the age of streaming (and services such as Shudder itself) have increased access to classic films, although Briggs does bemoan “the generation that has never seen a 35mm image on screen,” which he dubs as “a big loss.” We also touched on the growth of labels such as “elevated horror,” applied to films such as The Witch or Hereditary by first-time directors making splashy entrances to the genre. Again, Briggs bristles at the term. As The Last Drive-In draws close, Briggs can’t help but feel a little bit sentimental. Of all the aspects of the movie-hosting gig he performed for so many years, perhaps his favorite has been the fact that he was able to expose so many people to so many strange films they might never have seen otherwise. It’s something he’s been repeatedly reminded of throughout his career when making public appearances or meeting fans—the knowledge that his shows were the direct inspiration for a generation of horror geeks and future filmmakers. 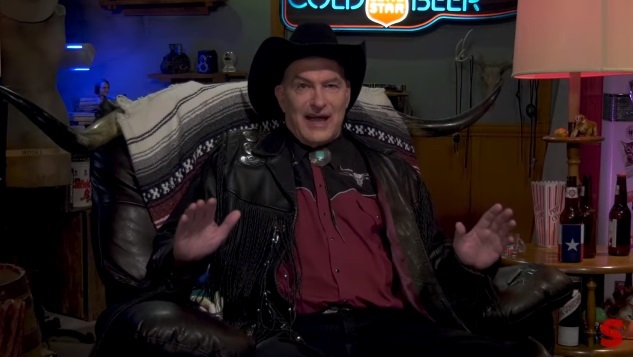 The Last Drive-In With Joe Bob Briggs airs in a live feed on Friday, July 13, exclusively on Shudder, starting at 9 p.m. EDT.